First a confession: due to crappy weather and being short for time I have not been on a doorscursion in over a month 😦 so again this week I dig into my archives. 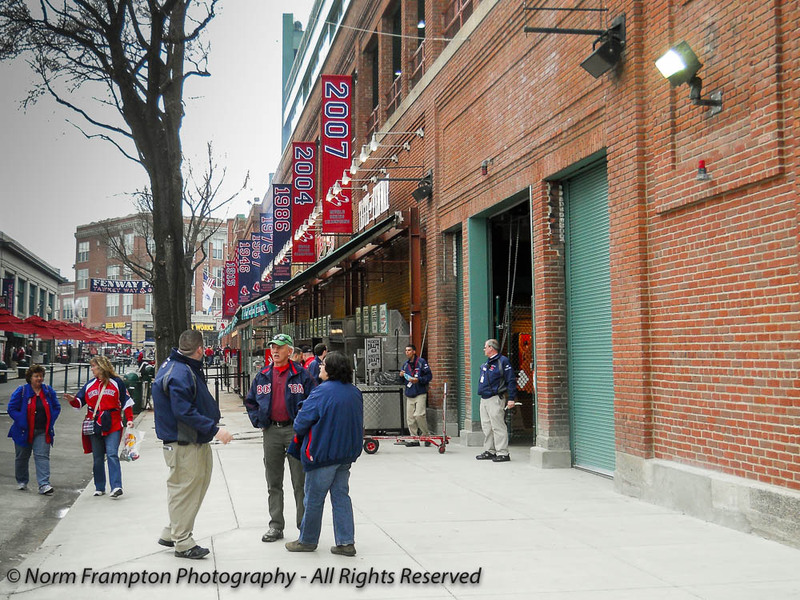 This time back to a visit a few years ago to the oldest park in major league baseball – Fenway Park in Boston. What this place lacks in wonderful doors, it more than makes up for in history. 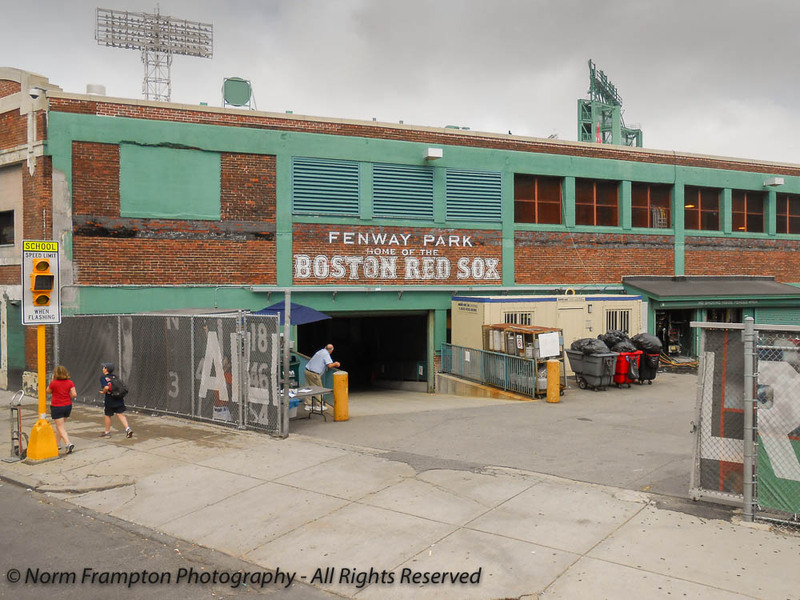 Home of the Red Sox since 1912 Fenway has a seating capacity of just under 38,000 making it one of the smaller parks in the major leagues, but that just adds to the charm of the place. For a baseball fan or a sports fan in general, visits to places like Fenway or Wrigley Field in Chicago make for top tier bucket list material, so I consider myself pretty lucky to have been to games here on a number of occasions. And the fact that Boston is a little over a 6-hour drive from me makes it a do-able road trip destination for a 3 or 4-day weekend. Arriving a good hour before game time is a great way to soak in the atmosphere and all of that history of this glorious old building. Of course when the crowds start filing in and the liquid refreshments start flowing it only adds to the show. 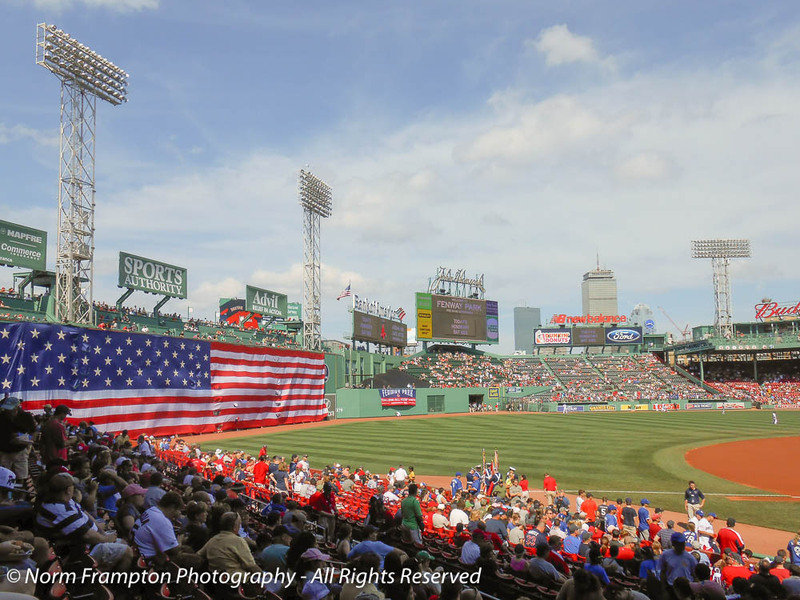 It doesn’t matter who they’re playing or even who wins – attending a game at Fenway is an event. As you make your way into the stadium the pennants and banners are a reminder of the teams’ successes over the years. The last time we were there the skies were threatening right up until game time, but as we made our way to our seats the clouds began to scatter making it a perfect spring day for a ball game. The famous left field wall known as the Big Green Monstah (that’s “monster” to you non-chowdah heads) was covered with one of the biggest flags I’ve ever seen. As an homage to the history of the place I played around in Lightroom with one of my game shots to bring out that old time feel. 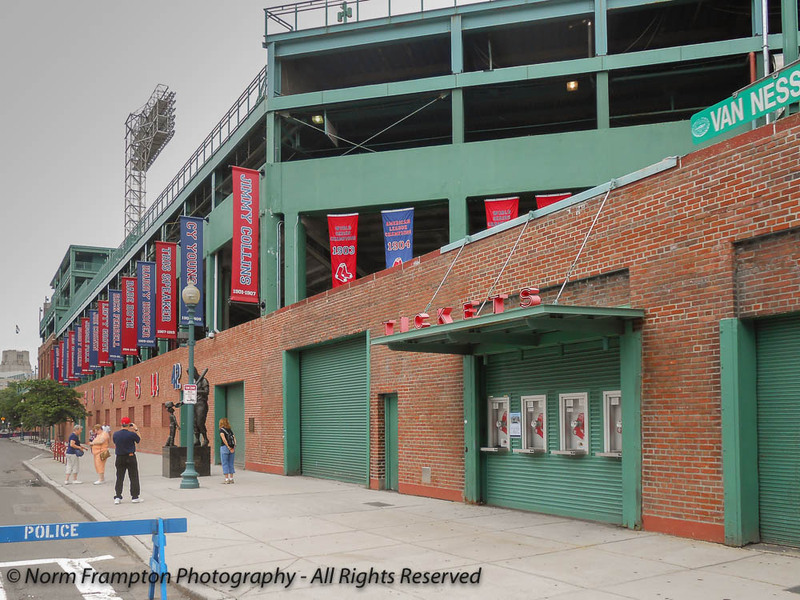 Gallery | This entry was posted in Photography, Thursday Doors and tagged Baseball, Boston, Doors, Fenway, Thursday Doors, USA. Bookmark the permalink. 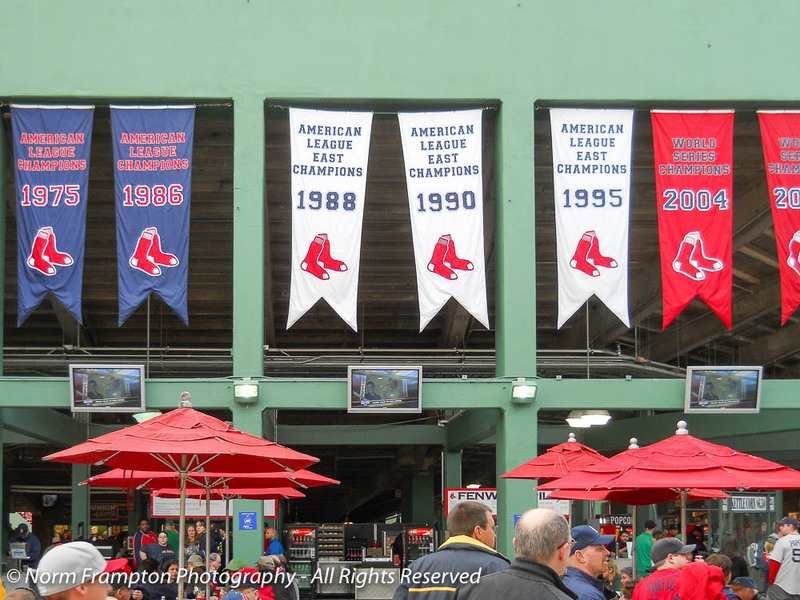 You did a beautiful homage photograph in this post of Fenway Park, Norm. First, LOVE the huge American flag displayed on the infield wall. Might be the biggest I’ve seen at a sporting event. 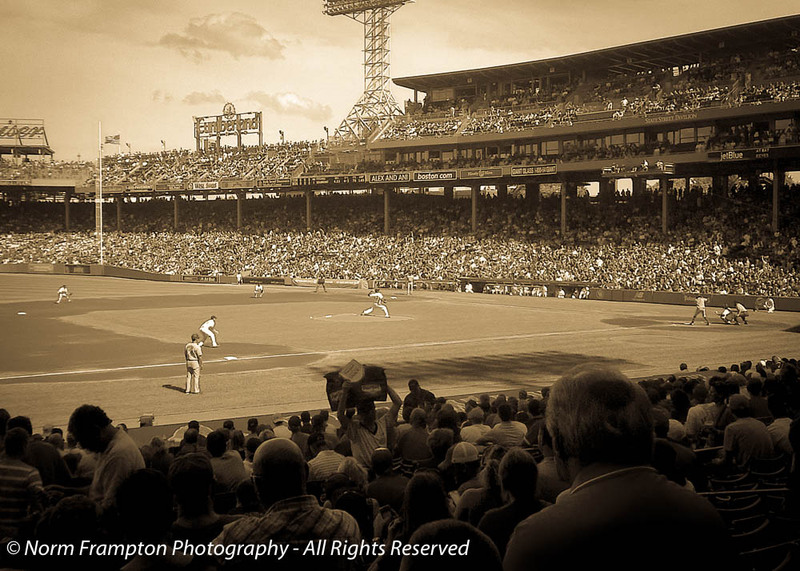 Second, your sepia, b/w, aged effect photo is wonderful and nastalgic and a great way to end your Fenway post. I don’t run to the TV when baseball is on but I’ve been to PNC park to see the Pittsburgh Pirates play and sitting in that beautiful stadium surrounded by an enthusiastic primanti eating crowd somehow turns me into a fan. Great post Norm. Baseball stadium architects seemed to have turned the corner after Camden Yards was built and became such a success. They stopped building huge-capacity concrete behemoths and came to realize that intimate and fan friendly was the way to go. PNC Park fits that bill nicely and I do hope to get back to Pittsburgh to actually catch a game there one day. Not a fan of baseball, but I LOVE Fenway Park!!! Such a great vibe here!! Fabulous post! Like the atmosphere you created in your pics here. Love the two two tubas! Nice doors and old time photo, Norm! Being so close to Green Bay and Lambeau Field, I truly appreciate the history of older stadiums. They have a special feel that the newer stadiums are missing. Yes indeed Lambeau would be right up there in terms of bucket list visits for sports fans. My Dad was a Packers fan in the Vince Lombardi days. I would have loved to take him to a game at Lambeau but unfortunately…. Thanks for the kind words. I know what you mean about knowing where you want to go. I have lots of cool spots I want to get to. It just seems lately that whenever I have time, mother nature won’t cooperate. Baseball season is upon us. Wonderful photos Norm. That old time shot really works, Norm. I really love the first photo, that backdoor shot — very timeless urban. Loved it! As a Cubs fan (I have been to Wrigley Field four times now) I know that centuries of chronic pain can eventually lead to salvation. There was talk of developing the area around the ball park last year… I hope they do it sensitively, with due respect for the heritage site that it is. Thanks Ian. I totally agree about sensible development. 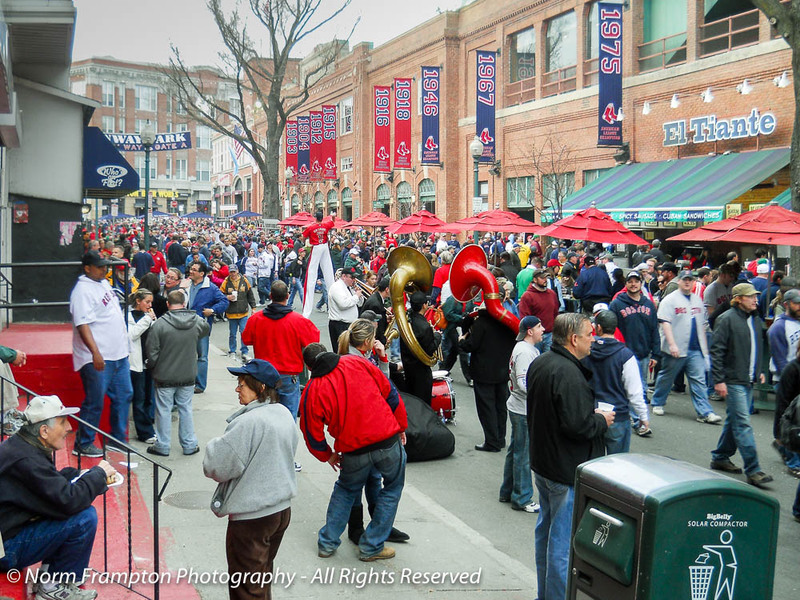 What a great post – baseball, doors, bands, everything for spring! Really like the final photo, very realistic to times gone by. I agree. Had to look closer after reading Jean’s comment. Darn! Sorry. I forgot that the link goes in the blue box. It’s there now so you can erase the one above if you like. Memory like a sieve! Full credit to Joey for first coming up with it. That last photo’s excellent! At a glance, I thought it was actually an old photo you discovered somewhere. Humble doors, yes, but the crowds, banners, and that gigantic flag certainly make up for that! Ok, I was jetlagged yesterday, thought I’d missed wordless wednesday and posted my door for today… flew from BWI to Seattle on Tuesday. Spacehead. Lovely photos!! My husband would give anything to go through those doors! I also like the sepia tone of the last one, and how you’ve caught the atmosphere in the other photos. Thanks Judy. I was wondering how best spell out that Bahsten accent. I had the same feeling as Jean, Norm. You did a great job on that photo. I’ve only been to Fenway once, but I did see the Sox win, so it was a great evening. I’m not usually a fan of Boston sports, but I love the fact that they have kept that stadium alive. I’m not a Sox, or Bruins, or Patriots fan either but yes, I do love that tradition and history are treasured enough to keep this place around. That’s a neat little stadium, Norm. Your last shot looks so genuine, at first I thought is was an old photograph. Hope the weather improves for you soon.